Everyone we know wants to do something else. Back around 1990, when Jonathan Larson was thirty, he wrote a one-man autobiographical musical, originally known as 30/90 (taken from the year and age at the time). Although it received a couple of workshop productions, it was soon eclipsed by Rent, which, as is well known, went on to win Tony Awards and the Pulitzer Prize, after his untimely death. tick, tick...BOOM! represents the first full staging of that show, which has been reärranged to accommodate three performers instead of one. David Auburn (the Pulitzer-winning playwright of this past season's Proof) came on board as a "script consultant" -- essentially as an editor or dramaturg, since all of the material is Larson's, derived from the various iterations of the show. Because of its time and place, tick, tick invites comparisons to three other shows. This past season, we saw A Class Act, a biographical post-mortem about another songwriter of musical theater, Ed Kleban. Unlike A Class Act, in which two of Kleban's friends examine his professional life, tick, tick...BOOM! focuses on a thin slice of Larson's life, the week or so leading up to his thirtieth birthday. As such, it's a much more interior work and, because Larson was, at the time, a relative unknown, its substance is more mundane. (Were it not already taken by another show, it might have been called The Me Nobody Knows.) Its story is a familiar one to anyone who has known or paid attention to musical theater writers hoping to find their way to Broadway: the sacrifices (emotional as well as economic) and, in some cases including Larson's, the struggles that are faced as one resists the temptations of high-paid corporate jobs as well as of a nice house in the country (and the wife that goes along with it) -- as expressed here, BMW's and dishwashers -- in favor of waiting tables in a diner and ascending to a grimy fifth-floor walkup when one finally gets home. As one of the characters in this show nails it, a "raging mix of envy and contempt." In the same space in which this show is performed, the pseudo-autobiographical Hedwig and the Angry Inch enjoyed a long and successful run. Both shows seek to redirect musical theater into the terra incognita of rock music. In the opinion of many, this writer included, Hedwig is the best rock musical to have been performed to date. So Larson's mix of pop, rock and musical theater forms doesn't hold up well by comparison. (From the standpoint of a musical theater purist, it suffers even more.) The contrast is further exacerbated by Stephen Oremus's arrangements, which cast most of Larson's music into a sort of demilitarized zone somewhere between the two camps. This brings us to Larson's great success, Rent. With a few notable exceptions, the songs on display here do not rise to the level of those in that show. Two,"No More" and "Therapy," show off Larson's quite remarkable talent for writing duets with competing vocals, and one, "Sugar," is entertaining and funny (largely perhaps because of Amy Spanger's terrific performance). The only song from another show, "Come To Your Senses" (from Larson's Superbia), might have been good as well, had it not been the victim of the double whammy of weak staging and anemic orchestration. A couple of the songs ("Real Life" and "Why") just seem unredeemable; the remainder are passable but not inspiring. (A cast album on RCA has just been announced, and will afford readers a chance to hear for themselves.) While the book for Rent has its problems, tick, tick's barely registers. Although not without its funny moments, David Auburn's doctoring has not been able to relieve some portions of the show remaining in the monologue form in which it was originally written of its tediousness. 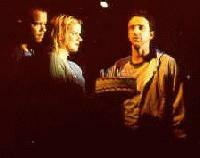 In its current form, the show gives Jonathan (Raúl Esparza) two friends, Susan (Ms. Spanger), his dancer girlfriend who wants him to move out of the city, and Michael (Jerry Dixon), his best friend who is gay and subsequently learns he is HIV+ and who gave up the theater for a career in market research and wants Jonathan to do the same. Both of the latter actors play a variety of other minor roles, most notably Spanger as Karessa, an actress cast in the workshop of Superbia. Scott Schwartz performs a few minor miracles staging this production on the narrow strip of stage he has been given (the onstage band, perched behind and above the action, consumes more than its fair share), but there are several times, especially early on, when his actors are both static and stiff. The parallels in subject matter between tick, tick and Rent are unmistakable, and the show is in many ways of greatest interest as it informs those similarities. In particular, as we hear the author's voice asking questions and expressing concerns, we are lead to a clearer understanding of the underpinnings of the characters in Rent. Likewise, we cannot help but smile as we hear again about the apartment keys that must be dropped out the window because the buzzer doesn't work, and witness the fun Larson has with those telephone calls from his parents and those messages on his answering machine. The performers and their characters, too, sometimes seem as if they are channeling their Rent counterparts: especially Esparza's Jonathan, sometimes sounding freakishly like Anthony Rapp's Mark, and Dixon's Michael, a cognate for Benny. All three performers are most able actors and singers. If Esparza comes off a bit too clumsy sometimes, one has to think its probably a pretty darn good reading of Larson. (The tapes of Larson's workshops are available; I don't know how much time he or his director might have spent studying them.) But there are times when this leads to less than great theater. Spanger does all right by Susan, but truly comes into her own as Karessa, and is awfully good as the awful market research woman conducting a product-naming session Michael convinces Jonathan to attend. (He is unceremoniously excused before it is over.) Jerry Dixon acquits himself well throughout. If there's one major complaint it's that none of the performers has the harder edge of Rent's Adam Pascal and Daphne Rubin-Vega, so we are left with a more traditional sound that seems to fly in the face of the music Jonathan keeps saying he is trying to make. Unlike A Class Act, which is framed by a memorial service that squarely addresses itself to the theater's loss, nothing in this show's presentation asks us to focus on such thoughts. Yet it's impossible to watch tick, tick...BOOM! and keep one's mind from wandering to Jonathan Larson, and the tragic circumstances that sometimes seem anticipated, but can't possibly be imagined in the story being told onstage. I can't help but think he'd want us to watch it just for what it is. ©Copyright 2001, Elyse Sommer, .